To start showing (off?) my scarf collection I thought to begin with the smallest formats I own, the silk pocket squares or pochettes, also called gavroches in Hermès-speak. I like these small scarves (45x45cm) for a pop of colour underneath a roll-neck sweater or as a silky touch next to my skin when wearing a big, warm wollen scarf in the cold to prevent a reaction to the wool. This was my first pochette and among my first Hermès pieces. It was a gift from my mother-in-law who chose extremely well. The colours are vivid but not overpowering (the size helps too, I can’t wear something big that is so colourful) and the design is among my favourite ones. It is called Mademoiselle Soie, created by Pierre Marie, and it depicts existing classical scarf designs from Hermès’s archives. A seamstress sits in the middle, surrounded by scarves and various sewing accoutrements. This pochette was part of a four scarf story, the other three showing Madame Cuir (leather), Monsieur Montre (watches) and – of course my favourite – Monsieur Parfum. Sadly these are impossible to find. If I ever come across the perfume pochette I shall snap it up right away. Here you see it tied. To add a personal story, (even perfume-related, yeah! 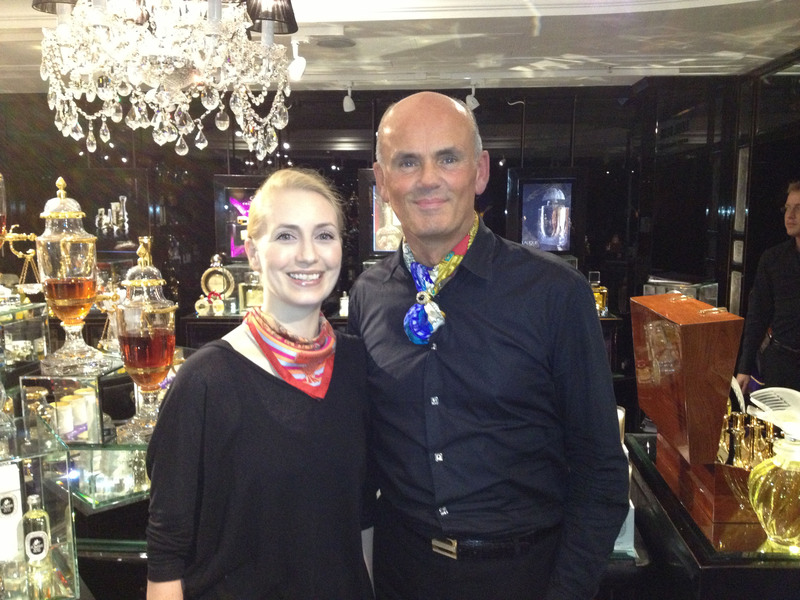 ), I wore this scarf when I met Roja Dove in his Haute Parfumerie in London. I was really nervous before meeting him and actually considered bolting and going for a drink instead, but then he came and right away commented on my scarf and – since he was wearing an Hermès scarf himself – we bonded over our love for silk. I relaxed and really enjoyed my time with M. Dove. So, this was the first one and, like before meeting Roja, I am nervous now too. But nonetheless, I enjoyed presenting this first scarf and I will make it a point to show you one per week, every Friday is now Hermès silk day! 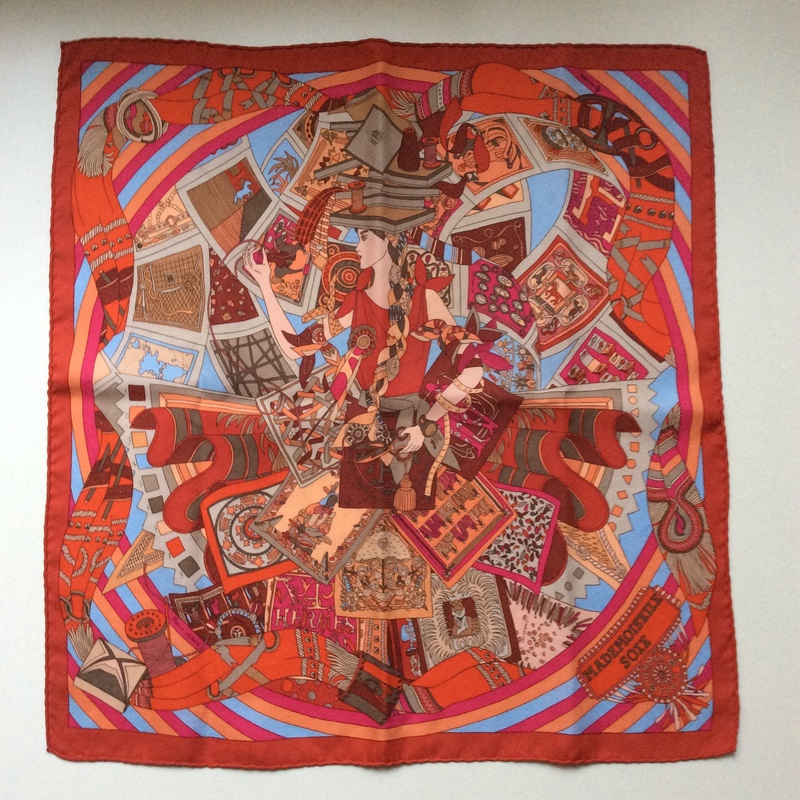 This entry was posted in Hermès, Scarf Collection and tagged collecting, Hermes, scarves, silk. Bookmark the permalink. The details are great in this one, always something new to find despite the small size. Great idea, having silk Fridays – beautiful gavroche! You might want to keep an eye on Vestiaire collective and the likes of it, as you never know what might turn up :-). Thanks, I am keeping an eye out. Silk with a story! Great. Lots of fabulous Fridays to come. Your first pochette is a stunner and you wear colour so well (especially Hermes orange! ), as that photo proves. 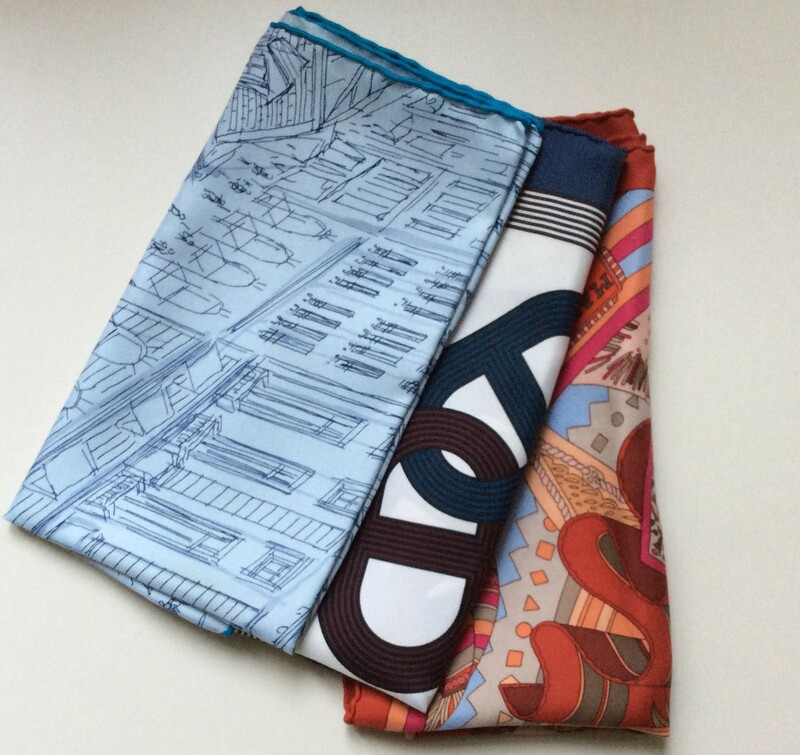 Are there places in Vienna where you can keep an eye out for the vintage scarves you’re seeking? No, no vintage haunts here that would be really helpful, but the internet has many great places to find lovely vintage things, it inly tales patience. Beautiful!! Love the scarf, it is just lovely on you, and am looking forward to your stories! I don’t have any silk scarves. Perhaps this new feature will inspire me to change that. I love that every scarf has a story to tell it seems. I’m looking forward to seeing the rest. They are quite lovely. Thanks, there is indeed a story to go with most of them, which is lovely to think about every time I wear one. Lovely post, Birgit. I want to see the a full picture (and story?) of that pale blue one with the Paris street sketches. And, if I may say so: There was no need to be nervous before meeting RD, as it’s quite clear that YOU know how to wear a scarf. He just murdered his. The blue one is coming next week. Dear Birgit, you always manage to guide my interests in new directions, other than fragrances. A few days ago, I bought the books from Marie Kondo (love them! ), who knows, how long it might take, before I buy my first Hermes scarf! I am looking forward to seeing more scarves and hearing more beautiful stories. So glad you bought the book! I hope you enjoy it. Beautiful, such lovely colors! Thanks for sharing your collection, Birgit. Looking forward to seeing more. I think Hermès should pay you, dear Birgit. You look flawless, as usual. They should indeed! 😉 (Unfortunately it is the other way round). You would make a wonderful ambassador for the house. What a lovely inheritance! I’m sure you’ll find a way to wear your Liberty scarves. YAY!! This is so interesting Birgit. How fun that you and Roja were both wearing your Hermes and what a sensible bonding point. Jin is so jealous of your collection, I think one day he will start collecting them too. Well he does have one B. The vintage one we bought at Drouot. It’s pretty special. You’ve seen me wear it. At dinner at Nascha’s. I loved it! I love silk, but am not good at wearing scarves. Basically I do not like too much fabric around my neck (even silk can annoy me at times!). Love the pale blue pattern in the first picture, so looking forward to getting a presentation of that one next week. There are many ways to wear a scarf without having it close to the neck. MaiTai has wonderful ideas including video tutorials, if you’d like to take a look. Birgit, you in that scarf is so lovely! I think Roja Dove looks good in his, too. This will be great fun, thank you! 🙂 The pattern on this gavroche is really cute and pretty. Glad you enjoyed this post, Kandice. Often vintage scarves can be found at a good price at antiques stores or the like, that might be an option to find your own silky treasure. 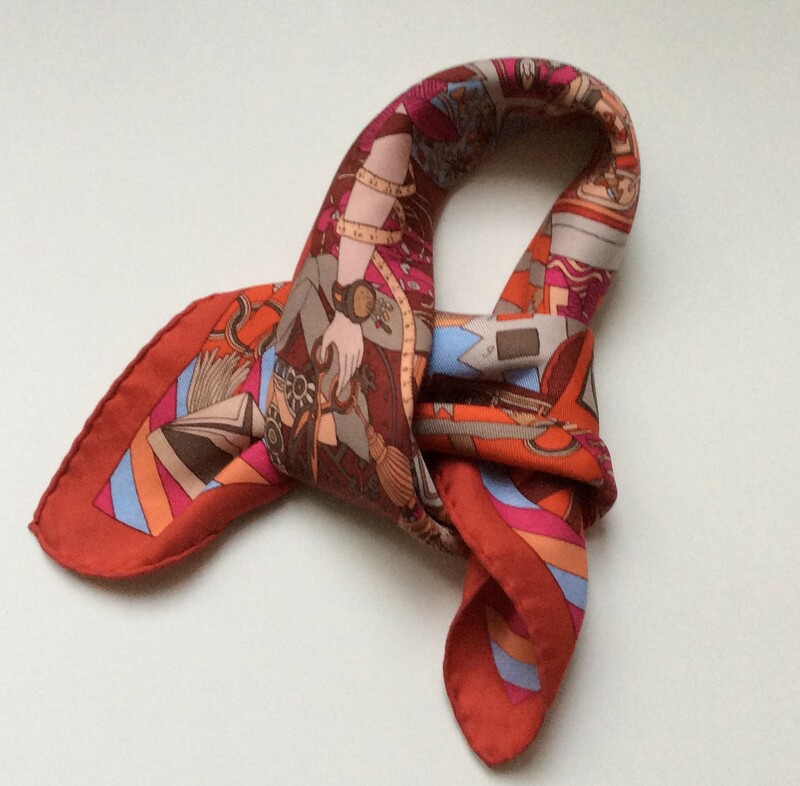 I love the red tones in this scarf and the jaunty way you wear it! Elegant and uplifting – the decluttering lady would approve of you keeping this one – all of them, no doubt! Oh sorry, didn’t mean it to take up all that space – just thought I was posting the link – feel free to delete! http://wp.me/p2DJxD-1ek . I would prefer your colors on my scarf though! And yes, I will keep in mind that you are looking for the perfume gavroche! To continue with my thoughts, started at the 2nd part of Hermes-scarfs-adoration posts. If on this photo with Roja D. you had nothing, just black — you would have looked much more enigmatic than with this scarf. It betrays you fully — what are your values and sadly those values are nothing special beyond the usual values of petite bourgeoisie as french say… (even if it is not true for you personally, it is just the image that it gives). One just get bored. PS: again, just critique of hermès scarfs per se, not you personally! See my comment on the second scarf post.